Drs. Sylvester Awagu, Ralph Flores, Patrick Moore, and Donald Mills are your trusted and experienced San Antonio, TX pediatric dentists and orthodontists. Our doctors and team care about the health and happiness of our patients of all ages, and we want them to have a wonderful pediatric dental or orthodontic experience. We understand the importance of establishing a good oral hygiene regimen early in a child’s life and we provide children’s parents with the necessary knowledge and treatment to maintain a healthy smile. 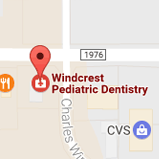 At Windcrest Pediatric Dentistry, our goal is to help your little one learn good oral hygiene skills for a lifetime of healthy, happy smiles. We specialize in pediatric dentistry for infants, children, adolescents, and patients with special needs making us uniquely able to work with young patients in a way that meets their unique dental needs during the early years of their lives. Our office is completely child friendly with televisions above the exam chairs, video games in the waiting area, and treasure trove of surprises. This inviting atmosphere, along with our cheerful and professional office staff, helps ensure that your children will have a fun, memorable and relaxing dental visit experience. Early orthodontic evaluations provide both timely detection of problems and greater opportunity for more effective treatment. Prudent intervention guides growth and development, preventing serious problems later. Following a thorough orthodontic evaluation, Drs. Donald Mills and Patrick Moore can determine if orthodontic treatment is necessary. If early orthodontic care is not needed, we will continue to monitor your child’s growth and development and begin treatment at the most appropriate time. Please contact our San Antonio pediatric dental office to schedule an exam and consultation with Drs. Awagu, Flores, Moore, and Mills today!